An prepares to fill the Toyota Mirai with compressed hydrogen from a hydrogen fueling station in Tokyo. Operating subsidies from Japan's largest automakers will be capped at about $90,000. TOKYO (Bloomberg) -- Japan’s three biggest automakers plan to help cover the cost of operating hydrogen stations in the country to popularize cars powered by fuel cells. Toyota Motor Corp., Nissan Motor Co. and Honda Motor Co. will cover as much as one-third of operating expenses for stations run by infrastructure companies, they said in a joint statement in Tokyo today. The support will be capped at 11 million yen ($90,000) a station. The program will run until about 2020 and cost an estimated 5 billion yen to 6 billion yen, said Kiyotaka Ise, senior managing officer at Toyota. Japan is planning to build hydrogen distribution facilities to encourage the use of what Toyota has called the next generation of auto technology. Prime Minister Shinzo Abe has said the nation will create a “hydrogen society,” with fuel cell also powering homes and office buildings. Researcher Fuji Keizai estimates that Japan’s market for hydrogen used in fuel cell vehicles will grow to almost 100 billion yen by fiscal 2025 from 400 million yen this fiscal year. Toyota introduced a fuel cell car, the Mirai, last year, and Honda has said it will start selling a hydrogen car this fiscal year. Honda aims to introduce a vehicle that can drive more than 700 kilometers (435 miles) on a single charge, Operating Officer Toshihiro Mibe said today in Tokyo. 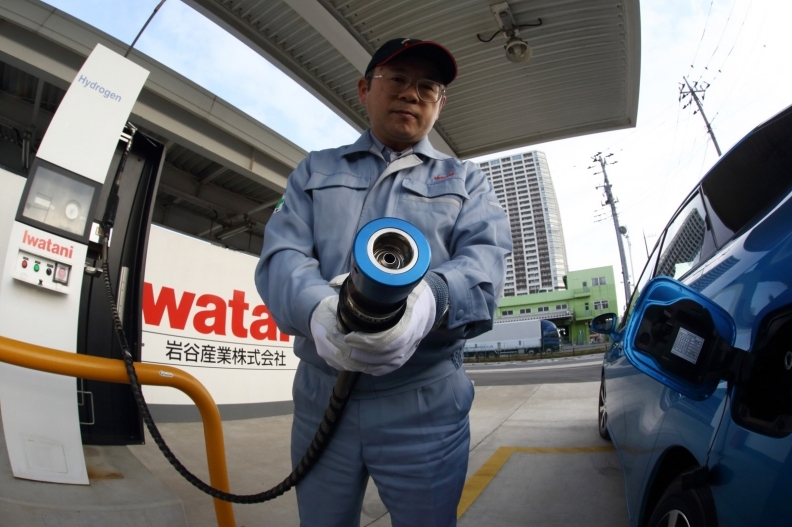 Japan’s national and local governments have also said they will subsidize the cost of operating hydrogen stations.